Credit rating agencies play an essential role in the modern financial system and are relied on by creditors and investors on the market. In the recent financial crisis, their power and reliability were often questioned, yet a simple rating downgrade could threaten to bankrupt a whole country. 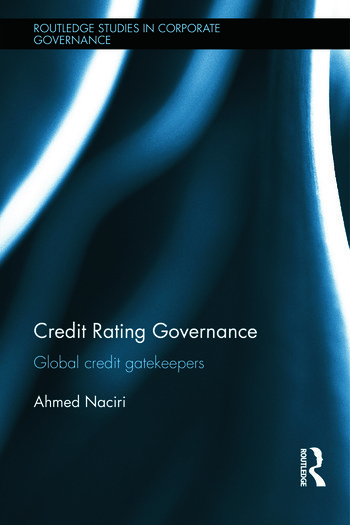 This book examines the governance of credit rating agencies, as expressed by their ability to fairly, ethically and consistently assign higher rates to issuers having lesser default risks. However, factors such as the drive for increased revenue and market share, the inadequate business model, the inadequate methodology of assessing risk, opacity and inadequate internal monitoring have all been identified as critical governance failures for credit agencies. This book explores these issues, and proposes some potential solutions and improvements. This will be of interest to researchers and advanced students of corporate finance, finance, financial economics, risk management, investment management, and banking. Ahmed Naciri is Professor at the School of Business at UQAM, Canada. His work has earned him the Award of Excellence from the Canadian Association of Administrative Sciences.